Former Republican legislative leader and corporate executive David Jennings will become the next superintendent of schools in Minneapolis. The Minneapolis school board picked Jennings Tuesday to replace Carol Johnson, who resigned to become superintendent in Memphis, Tennessee. Board members say they didn't need to look further, because Jennings has the leadership skills and political knowhow they need. Minneapolis, Minn. — Minneapolis school board members scheduled a three-hour meeting to discuss the challenges facing the district and the characteristics desired in a new superintendent. Carol Johnson held the job for six years, leaving big shoes to fill. As board members listed the necessary skills and qualities, it quickly became clear the person they were describing was sitting in the same room. Board chairwoman Sharon Henry-Blythe described David Jennings as the right type of leader at the right time. "The challenges we have at the Legislature, the need for someone to be able to communicate across a number of industries, communities or organizations. That kind of thing is critical for us right now," says Henry-Blythe. Carol Johnson hired Jennings away from the Minneapolis Chamber of Commerce nearly two years ago to work as the district's chief operating officer. After Johnson announced her resignation two months ago, school board members asked Jennings to serve as interim superintendent. She has a lifetime of experience in classrooms, that gives her certain kinds of innate capabilities that I don't have. I see the world differently because of a lifetime of experience not in classrooms. School board member Audrey Johnson say she was initially ambivalent about the hire. She now calls Jennings a very capable leader. "I have been pleasantly, pleasantly surprised and very, very happy to have ... his skills come to bear on the things that we're doing," says Johnson. "(I) find him to be someone I can admire and respect, that is completely dedicated to this school district and the concept of public education as I see it." Jennings spent 10 years in the Minnesota House of Representatives, including two years as Republican Speaker of the House from 1985 to 1986. Jennings also served as state commerce commissioner under Gov. Ventura. School board members like Colleen Moriarty say his political background will help the district fight off threatened cuts in state funding. "I have confidence because he's shown to be a warrior for public education in the city of Minneapolis. And I think that's what we need," says Johnson. The decision to forego a national search also saves the cash-strapped school district an estimated $50,000 or more to hire a consultant. An internal hire also mean less time spent in a leadership transition. Jennings says he happily and proudly accepts the challenges of the job. He's also making it clear that he won't be another Carol Johnson. "There's just no question that my style is different than hers, and my life experience is different than hers," says Jennings. "She has a lifetime of experience in classrooms, that gives her certain kinds of innate capabilities that I don't have. I see the world differently because of a lifetime of experience not in classrooms." Jennings says he plans to hire a chief academic officer to provide the expertise in education that he does not have. Jennings faces a tough road ahead with employee contract negotiations. Teachers are fighting against a proposed wage freeze. Louise Sundin, president of the Minneapolis Federation of Teachers, says the new superintendent has a lot of work to do. "We don't get anywhere with kids and community unless we have the very most skilled teachers, who feel they are respected. And right now teachers don't feel respected or appreciated," says Sundlin. 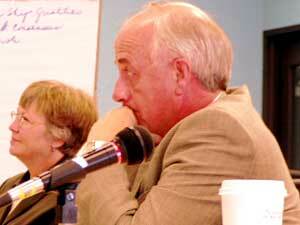 The Minneapolis school district will hire a legal firm to negotiate a superintendent contract with Jennings. It's unclear how it might compare to Carol Johnson's $160,000 annual salary. Final board approval on the contract could come within the next month.